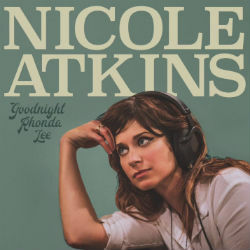 Album Review: Nicole Atkins, "Goodnight Rhonda Lee"
But you can’t just keep stealing all the great musicians from the East Coast. We’re dying over here. We’re getting slammed by everything from hurricanes to political movements telling us we’re not “real America,” which apparently only exists if you can see a corn field or coal mine from your house. The latest is Nicole Atkins, whose voice should have been declared a state treasure in New Jersey. She’s a throwback in one sense — it’s easy to imagine her being fed a steady stream of Brill Building tunes and dueling with a Phil Spector Wall of Sound or a gargantuan Jimmy Webb arrangement. But she has embraced modernity, hosting a wonderful SiriusXM show and crowd-funding her albums with charming videos and other updates for those of us shrewd enough to chip in a few bucks. And she also writes the bulk of her own songs — quite well, in fact. At some point, New Jersey isn’t going to take this any more. You already borrowed Bon Jovi for a while. What next — a mashup of Born in the USA with Courtesy of the Red, White and Blue? Don’t tell us you needed to take Atkins away from the East Coast to broaden her musical horizons. She’s already adept at any genre she chooses. Her Wikipedia page lists her genres as “crooner, soul, psychedelic, Americana.” Well, that narrows it down. Sure, the country detour she takes on a couple of tunes on her new album, Goodnight Rhonda Lee, is worthwhile. She co-wrote two songs with Chris Isaak, each one turning the clock back a few decades. The opener, A Little Crazy, would be a little cliched if not for that gorgeous voice cutting through the over-the-top production. The titletrack, a wistful farewell to a trouble-making alter ego, brings modern psychology to a traditional country setting. But, dear city of Nashville, we didn’t need you to teach Atkins how to get in touch with her inner Patsy Cline. She covered Cline years ago, one of many demonstrations of her genre-hopping skills. She also showed her range with a short collection of covers, Nicole Atkins Digs Other People’s Songs, in which she does a perfectly fine job of bringing Dream A Little Dream of Me to life, gives a lively reading of Nada Surf’s Inside of Love and takes the listener on a wondrous melodic ride on The Church’s Under the Milky Way. And she shows plenty of range in her own work. Like Rachael Yamagata (probably the next East Coast chanteuse-songwriter you’re going to steal away from us), she knows her way around a torch song in both spare and complex arrangements. She even shows dramatic range in her videos, from the foreboding Vultures to the playful Girl You Look Amazing, where she dances, bowls, dines and makes out with an invisible man over sharp guitar hooks and a disco bass. Now she’s married. And newly sober. After years of finding hope in yearning and heartbreak — check out Together We’re Both Alone or Maybe Tonight — she’s certainly earned a life of domestic bliss. If she needed to move to make all that happen, fine. We get it. At least she left a nice note, bittersweet with a touch of the macabre, with the new tune I love Living Here (Even When I Don’t). The common thread is all her different styles is that she sings the hell out of everything. It’s not all American Idol or modern RnB ego-tripping. I listened to Girl You Look Amazing for probably the 100th time this morning, and I still marvel at the subtle touches she brings in every line. She’s like a master blues guitarist, using bends and vibrato to bring the most out of a melody. I’d pay to hear her sing Three Blind Mice. Or maybe her next album will be heavy metal. Either way, I’m sure I’ll still be hearing something new on the 100th listen of Listen Up. So look here, Nashville. You didn’t make Nicole Atkins better. She made you better. And we’re not going to sit back and let you monopolize great singer-songwriter talents. At least she’s on tour this summer, and I can check her out in Arlington. Wait, what? That’s Arrington, Va., not Arlington? Dammit. Well, maybe one of my kids will go to Vanderbilt or something.